What on Earth was that? A branch? A piece of coral? The petrified arm of an Ent? No, as many of you guessed, it’s a fulgurite! Fulgurites form in a flash – when lightning strikes simple beach sand or desert soil on a surface that conducts electricity, such as water, at a temperature of at least 3,270 degrees Fahrenheit (1,800 degrees Celsius). The extreme heat forces the grains of sand (or sometimes soil or rock) to melt and fuse together. The product cools, producing a hollowed glass structure that mimics the appearance of a tree root or large branch. Photographer Stan Celestian found this 14-inch sand fulgurite on the outskirts of Queen Creek, Arizona on May 4, 2005. He submitted the image recently to the Earth Science Picture of the Day Web site , where it appeared on October 26th. Why the odd shape, you might wonder? The lightning bolt fans out in several directions as it hits the water in an attempt to release its energy. The length of each “branch” of a fulgurite is equivalent to how quickly each path of the lightning strike exhausted itself of energy. Fulgurites are rare enough to cost hundreds of dollars depending on size and shape, and intriguing enough to be the focus of research projects. A 2009 University of Arizona-Tucson study , for example, found that fulgurites contain a partially-oxidized form of phosphorus called phosphite that early microbes may have thrived on as a nutrient. This summer, a NASA-funded study revealed that fulgurites can experience a range of temperatures during formation. So, next time you want to impress your friends with arcane but fascinating trivia, ask if they know what a fulgurite is. When they scratch their heads and offer blank stares, boot up your laptop, show them our What On Earth #5 post and explain this fluke of nature. You’re sure to dazzle them with your extra-ordinary intelligence and one of the marvels of science. When a deadly landslide killed nearly 100 people and forced the evacuation of 75,000 in Guatemala on May 30, NASA carefully documented it. And when more than 300 other rain-triggered landslides pulled the Earth out from beneath towns and villages in China, Uganda, Bangladesh, Pakistan and other countries in 2010, NASA researched and documented each one. Sudden, rain-induced landslides kill thousands each year, yet no one organization had consistently catalogued them to evaluate historical trends, according to landslide expert Dalia Kirschbaum of NASA’s Goddard Space Flight Center. Three years ago, Kirschbaum set out to change that by creating a searchable inventory of landslides specifically triggered by rain. WhatOnEarth spoke with Kirschbaum to understand how this tool might tell us more about when and where landslides are most likely to occur. WhatOnEarth: What is a landslide? Kirschbaum: Landslides occur when an environmental trigger like an extreme rain event — often a severe storm or hurricane – and gravity’s downward pull sets soil and rock in motion. Conditions beneath the surface are often unstable already, so the heavy rains or other trigger act as the last straw that causes mud, rocks, or debris — or all combined — to move rapidly down mountains and hillsides. Unfortunately, people and property are often swept up in these unexpected mass movements. Landslides can also be caused by earthquakes, surface freezing and thawing, ice melt, the collapse of groundwater reservoirs, volcanic eruptions, and erosion at the base of a slope from the flow of river or ocean water. But torrential rains most commonly activate landslides. Our NASA inventory only tracks landslides brought on by rain. WhatOnEarth: What prompted you to develop the NASA landslide inventory? Kirschbaum: The project was initially meant to evaluate a procedure for forecasting landslide hazards globally. Studying landslide hazards over large areas is a thorny, complicated task because data collection is not always accurate and complete from one country to another. Improving our record-keeping is a first step in determining how to move forward with landslide hazard and risk assessments. As a byproduct, we knew the catalog would provide information on the timing, location, and impacts of the landslides, which is valuable for exploring the socio-economic effects of these disasters. The International Disaster Database, the largest of its kind, often does not record smaller landslide events or detail their human or property toll. Each one of our landslide entries contains information on the date of the event; details about the location; the latitude and longitude; an indication of the size of the event; the trigger; economic or social damages; and the number of fatalities. WhatOnEarth: How is a landslide inventory useful or important? Kirschbaum: As the catalog of events grows, we’ll be able to extract more and more information about which countries have the highest number of landslide reports, highest number of fatalities, etc. We can also break down events by region, season, and latitude, which helps us identify some large-scale patterns. Though the database is limited by occasional reporting biases and incomplete data, the catalog indicates that the highest reported number of rainfall-triggered landslides and fatal landslides occur in South and Southeastern Asia. We also believe that in the longer term, the catalog will enable us to identify patterns in the global and regional frequency of landslides with respect to El Nino and related climate effects. 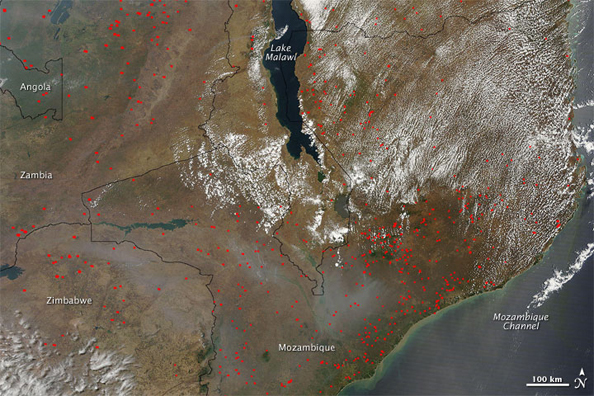 WhatOnEarth: Have you used satellite observations for the inventory? Kirschbaum: No. In a few instances we’ve been able to obtain satellite images over an area where a landslide is clearly visible. However, landslides typically occur over small areas. Satellites cannot generally “see” such fine ground details or do not pass over the affected area with the frequency necessary to capture when the landslide occurred. We hope to use satellite imagery, for example from NASA’s Earth Observing 1 (EO-1) satellite, to evaluate the location and area of some larger landslides. This remains a work in progress. WhatOnEarth: So, if satellites can’t yet help you track landslides, how do you analyze each landslide event? Kirschbaum: We have searched online literature – sources such as news reports, online journals and newspapers, and disaster databases — for the years 2003 and from 2007 to the present. The landslide inventory is only as good as the availability and accuracy of the reports and sources used to develop it. The work can be tedious and time-consuming, so we’ve enlisted the help of several excellent graduate students to keep the inventory updated over the past three years. Our database tries to capture as many rainfall-triggered landslides as possible, but this is often difficult due to limitations in reporting of landslide hazards. The accuracy and completeness of details surrounding an event — especially when many landslides are triggered from a very large rainfall event over a broad area– can be less than informative so we are continually trying to improve the cataloguing effort. At the end of this year we’ll have a five-year record of events which will provide us more information to identify global trends. WhatOnEarth: Is the NASA’s landslide inventory only available to lay people? Kirschbaum: Our compilation methods were published in a scientific journal last year, and the actual inventory is now openly available to anyone on the Web. We’ll be posting the inventory from January through June 2010 shortly. 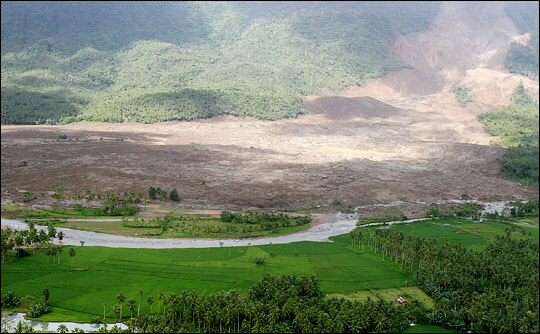 Image Information: A massive landslide covered the Philippine village of Guinsaugon, in 2007, killing roughly half of the 2,500 residents. Credit: U.S. Marine Corps./ Lance Cpl. Raymond Petersen III (top). A map of landslide events in 2003, 2007, and 2008. Credit: NASA/Dalia Kirschbaum (above right). High above Earth’s surface – 300 miles to be precise – a special set of twins continually unveils new information about our planet. They’re not human twins, nor are they the constellation we know as Gemini. They’ve arguably, however, attained star status in their eight years in space. 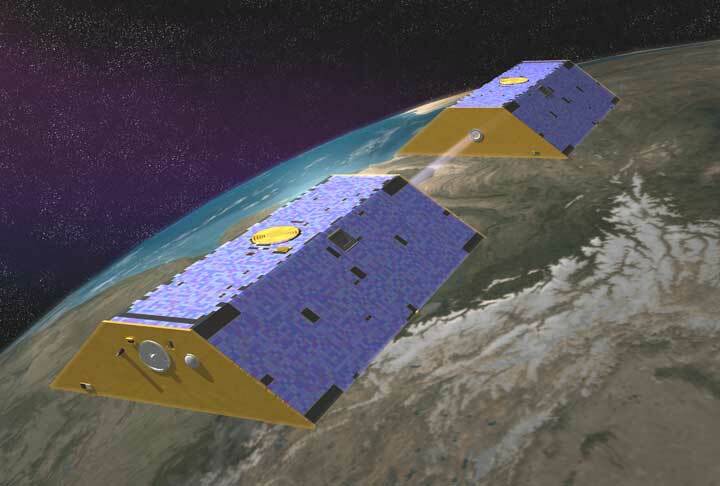 They are the Gravity Recovery and Climate Experiment, or GRACE, a pair of NASA and German satellites that fly about 137 miles apart, changing position relative to one another in response to variations in the pull of Earth’s gravity. A microwave ranging system captures microscopic changes in the distance between the two satellites. GRACE responds to gravity changes that occur when mass – primarily water and ice – on or beneath the surface changes. And like many stars, the harmonious GRACE twins have achieved some very big hits. They’ve racked up unprecedented observations of some of the world’s most famous waterways; shed light on ice loss at the coldest reaches of the globe; and rendered first-time measurements of changes in hidden groundwater reservoirs that sustain millions daily. Though GRACE has also shaken up old ways of studying changes in solid ground – in the aftermath of earthquakes, for example – today’s nod is to the mission’s contribution to water science. 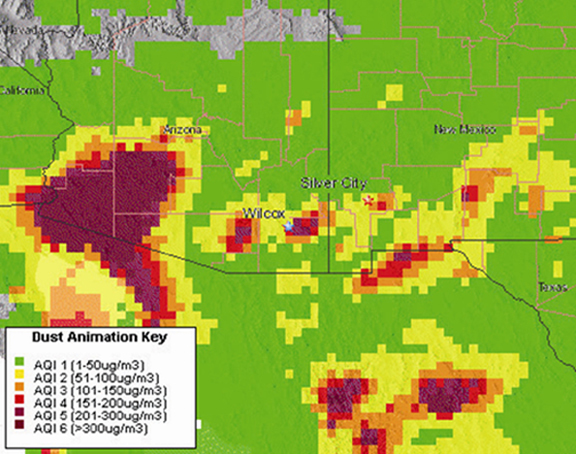 Data from GRACE were used to measure recent year-to-year water losses from Central Valley aquifers in California’s most productive agricultural region. An international study recently used GRACE data to show that ice losses from Greenland’s ice sheet are rapidly spreading up its northwest coast. NASA scientists found that groundwater levels in northwestern India have been declining by an average of one foot per year. More than 26 cubic miles of groundwater disappeared between 2002 and 2008 – double the capacity of India’s largest surface water reservoir and triple that of Lake Mead, the largest man-made reservoir in the United States. NASA scientists used GRACE measurements to directly monitor and measure the complete cycle of water movement for South America – a first for an entire continent. GRACE data confirmed the mass of ice in Antarctica decreased significantly from 2002 to 2005, enough to elevate global sea level by 0.05 inches during that period – about 13 percent of total sea level rise observed over the same four years. Every tale has more than one side or perspective. And so it is with NASA, which studies Earth science from different angles – from satellites, from aircraft, and sometimes from the ground. But somehow, no matter how many ways there are to view a place, there’s nothing better than being there. Case in point: Bryce Canyon National Park in Utah. The interlocking peaks of the canyon rim can top 9,000 feet – high enough that year-round flurries created this snow-capped winter wonderland captured by photographer James Van Gundy. The spectacular oranges, browns, reds, and yellows of the limestone and the unique rain- and frost-carved stone make the park a destination for more than 1.5 million tourists each year. Those peaks offer breathtaking views of three states and 200 miles of visibility. In contrast, a Landsat satellite image of the park, taken in 2006, tells a top-side story of streams and rivers and valleys that stretch out like the fingers of a child’s hand print. 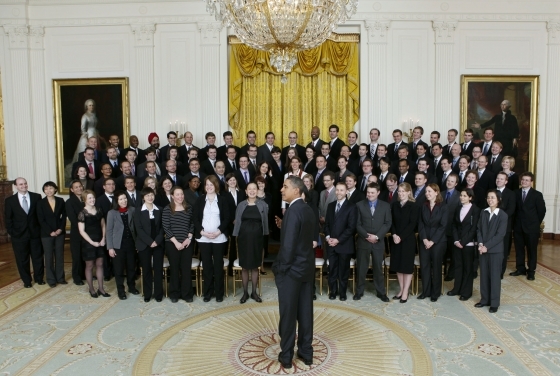 A host of new colors emerge, not apparent from the ground view. The greens of coniferous forests. The blues of lakes and the Tropic Reservoir. To see more Web images from Earth Science Picture of the Day, click here. To see more examples of the Image of the Day from NASA’s Earth Observatory, click here. An early morning sun illuminated the light rain over Nevada, Missouri, on May 14, 2009, spraying rays across the sky. Photographer Tommy Hornbeck captured what some viewers may believe to be virga, rain that evaporates before reaching the surface. However, Jim Foster, a hydrologist at NASA’s Goddard Space Flight Center, confirmed with Hornbeck that the rain did indeed dampen the ground and the photographer below. The Earth Science Picture of the Day, a web site led by Foster, has received and posted hundreds of captivating images like this one. The site, which marks its 10th anniversary this year, showcases imagery of people who want to share what they observe; photographs that illustrate the marvels and nuances of Earth and our relationship to it. Sun bounces off rain drops. Bright-colored insects take temporary refuge on plant leaves. Ocean mist changes the look of the air where it hangs suspended. You get the idea. With support from the Universities Space Research Association and NASA, Foster’s longtime project to educate and engage the public about Earth science has made as many as 3,600 images available online for science enthusiasts. Want to submit an image to Earth Science Picture of the Day? Click here to learn more. Keep in mind that the images must be your own, and you’ll also need to provide permission for Foster’s team to post them to the site. Good luck! Author gcookPosted on March 15, 2010 March 8, 2013 Tags aerosols, clouds, General, health2 Comments on Can Something Out in Space be Good for Your Health on Earth?